Our online dance shop based near Basingstoke, Hampshire has been supplying dancewear, dance shoes, accessories and gifts. 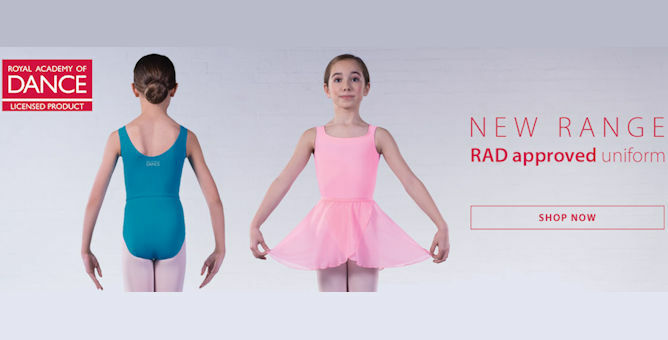 Suppliers of ballet uniforms for RAD, ISTD and bbodance for over 17 years. All kinds of dance catered for including ballet, jazz, tap, character, ballroom and gymnastics clothing. Including dance fitness. Stockists, importers and suppliers of some of the biggest names in dancewear including Bloch, Capezio, Freed of London, Tappers and Pointers, Bunheads, Katz, 1st Position, DSI London, Supadance, Sansha, SoDanca, Mondor, Wear-Moi and Jenetex.